Black Seed Oil has been used historically as a powerful medicinal herb for thousands of years in the Middle East, parts of Asia and Africa. It is becoming more well-known in the West and has been extensively researched and investigated using modern scientific techniques and focuses on very specific health conditions, including Cancer, Diabetes (Type I & II), Hair Loss, Autoimmunity and Cardiovascular problems to name a few. It has also been thoroughly studied for its biological properties and therapeutic potential and has shown to perform a remarkable number of distinct pharmacological actions in the human body, including anti-bacterial, anti-fungal, anti-inflammatory and anti-convulsant actions. I have been taking this Black Seed Oil now for nearly four months which is their strongest. Although at the beginning I was taking this Black Seed Oil which was their mildest and progressed upwards. It is recommended to start on a low dose first and work your way up as a common cause of adverse reactions with herbal supplements is taking too high a dose too quickly. Your body can only clear out toxins and congestion at a given rate and exceeding this rate can cause you to become unwell. I started taking one teaspoon of the MILD strength oil (typically contains 1.2% of volatile oil) with one teaspoon of honey on an empty stomach, first thing in the morning – double-remedy whammy! Plus, it takes the edge off the taste as it’s quite pungent the stronger the volatile content is! I then increased to two teaspoons of oil per day when the MILD bottle finished and progressed to the ORIGINAL strength oil (typically contains between 1.5% – 1.7% volatile oil). Once that bottle finished I went onto the STRONG strength oil (typically contains between 4.3% – 4.9% volatile oil). N.B – Most Black Seed Oil on the market contain somewhere between 0.3% – 1.2% volatile oil! My Health Experiences So Far…. Within two weeks of taking the MILD strength, I noticed that I was falling asleep more quickly than before. I had developed insomnia since having my son (who is now 4 years old) and could lay tossing and turning in bed for hours trying to fall asleep. And when I did eventually fall asleep (which never lasted more than three hours), I would be awoken by the slightest of noises and would find myself back at square one tossing and turning in bed again. Let me tell you, five years of broken and interrupted sleep can leave you feeling constantly tired, irritable, snappy and moody and generally not a nice person to be around! I felt like a walking zombie on constant auto-pilot. I am still taking the STRONG oil, twice a day with honey….and my sleep has been a God send! I’m sleeping much better. I’m sleeping for longer and it takes me less time to fall asleep and even when I’m woken up through the night (usually by my son wanting the toilet or my husband snoring away), I find I’m falling asleep so much more quickly. I’m having much deeper sleep too which means I’m having dreams again which are quite vivid and surreal! I wake up now feeling more refreshed and energized rather than the tiredness, dullness and fuzziness that clouded my brain which I was waking up to and the feeling of dread of another day feeling snappy and moody. Another point I’d like to note is that my hay fever seems to be have dissipated this year, even though in the UK, the hay fever season is in full swing. No sneezing, no itchy, runny and red nose, no sniffling…nope none of the symptoms associated with hay fever so far. Hooray!…Black Seed Oil can help with allergies and hay fever and it seems it’s working for me. Overall, I’m pleasantly surprised that this has worked so quickly as usually with anything herbal or natural, it does take a little while to see some improvements. I feel very positive that the oil has helped with my insomnia and hay fever and hopefully, it will continue to help boost my health in the long run – so this is definitely something I will be taking on a daily basis for as long as I’m able to. I’m still taking the oil twice daily with honey- once in the morning on an empty stomach and once at night and hour before bed. I have further noticed that it seems to have helped my asthma somehow. My asthma is relatively mild thankfully and lately, I’m not needing my inhaler as often especially when I’ve done some strenuous exercise such as pushing myself a bit harder when I’m swimming or after I’ve been for a run. Being an asthma sufferer since I was 12, this is a really pleasant surprise. Although saying that, I will still carry my inhaler with me whenever I’m out. Just in case. Old habits die hard, I guess. Have you tried Black Seed Oil before? What did you take it for? Did it work for you? I’d love to hear your thoughts and comments on this. Peace be with you. How long does it take Black Seed Oil to work? I noticed a difference within TWO WEEKS of taking the MILD strength oil for my insomnia. I never knew that the black seed oil could help in getting better sleep. I’m suffering Insomnia from time to time. Maybe because I drink lots of coffee, especially espresso. What is important to me more, is that I’m looking for a natural way to stop, or at least, reduce hair loss. I noticed that you mentioned this as one of the problems that can be solved using black seed oil, but it is not clear how to use it. Do you have any article on this? Thanks for your question. Several of my readers have asked about how Black Seed Oil can help with hair loss and from my research, massaging the oil all the way to the roots and leaving on for an hour before rinsing off with shampoo can help with hair loss. As with any herbal treatment, patience and diligence is a must- one to two months to see any difference. I’ve included an article that can also help with your query. I hope this helps. Hi, I just started taking black seed oil gel tablets for 5 days now, wondering which of the 2 gel tablets or liquid works faster and effects quickly more noticeable. Can the oil be mixed with other liquids other than juice, smothie’s or honey? I’ve only taken the liquid form before so can’t make a comparison as to which works quicker. As I mentioned in the post, I noticed a difference within 2 weeks – now I think this is pretty fast especially for anything herbal or natural! I’m sure you can mix it with other liquids but best if not hot as it can damage the properties and healing qualities of the oil. The fact that Black Seed Oil can be quite pungent – using it in honey, juice or anything sweet disguises the taste. Hope that helps and peace be with you. Thank you for sharing about the black seed oil. I have been very interested in the benefits of therapeutic oils, and I had never heard of this oil. I have even looked up oils that will help with things like neurological conditions, and had still not heard of this oil. I had clicked on a few of the links from the other articles about specific things it helps with. I would be interested in knowing more about how it could or should be used for specific health conditions if you have any information about this. 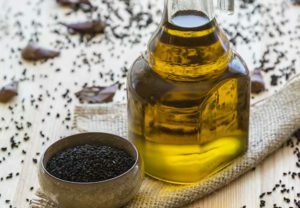 The use of Black Seed Oil has been researched and recognised extensively by modern science and I have written a very comprehensive introductory article relating to its amazing healing powers. Check out Part 2 here if you want to discover what this amazing plant does and how it works. Discover what the plant is good for in Part 3. The list is extensive and there are studies have shown that Black Seed has protective effects against neuronal damage and neurotoxicity. Read Part 4 to know of any side effects, what to look for when buying and how to take it. I hope this info helps with your quest to find solutions to neurological conditions. Have a great week and peace be with you. Wow – I’ve heard of this before. Sounds great. Have you ever heard of anyone with ALS having success in reducing cramps? I’ve included some links to your question. Hope it helps. I’m really glad to hear that you’re sleeping so much better. I’ve been looking for something natural that will both help me get to sleep and stay asleep. I have always been a light sleeper and it definitely makes for a tough day when I don’t get a good night’s sleep. Did you notice the improvement in your sleep relatively quickly? Or do you feel like it took some time to build up in your system first like some things do before they have an impact? As I mentioned in my post, I noticed I was falling asleep much more quickly, within only 2 weeks of first taking the MILD oil. I was pleasantly surprised as with anything natural or herbal, it can take a month or two to notice or feel any different. I hope you manage to sort your sleep out and let me know of your experiences of the oil should you decide to take it. Have a great week! Great read here. I think this maybe something I’ll have to look into. I have heard of black seed oil before and now I have some good info about it. Thanks! You’re welcome David! Reading the scientific literature that I’ve highlighted in my post will definitely help too. Thanks for stopping by. I have a question though. Is it more difficult to wake up after you have taken it? nope, I haven’t experienced any difficulty waking up (I guess that’s because I have a 4 year old bouncing on my bed in the mornings!). I don’t feel groggy or tired – I just feel like I’ve had a good night’s sleep especially as I’m not wasting so much precious time tossing and turning trying to fall asleep. I’m definitely going to see if my husband will try this. He has the same sleep issues- trouble falling asleep and even more trouble staying asleep. I’m sure there is a detoxification piece to his insomnia. Thanks so much for the info and the recommendation! One question though- does it need to be taken on an empty stomach? I see you take it first thing in the morning so I wasn’t sure. Thanks! I take it on an empty stomach as my father-in-law (who works in the medical field) suggests that it is the best way to take it. Coming from a Middle Eastern heritage, he’s been taking it for many years and me being the novice, I’m not going to argue with that! It’s fine to take it throughout the day or before or after food. Because of potency, it’s best not to exceed the recommended dose of 3 teaspoons per day. I hope your husband does find some solace from using this as it has helped me tremendously with my insomnia. Thanks for reading. This is super interesting, especially because I’m someone who’s actually into fitness. I’ve actually never heard of this stuff though, but it’s really cool that it helped insomnia because ironically enough, I have that too lol. But if this helps it then that alone makes it completely worth it. Are there different types of ways of mixing it though? many people do find the taste quite pungent. It’s an acquired taste that’s for sure! You can mix it with juice or even add into your smoothie but best add to a cold drink rather than a hot drink as this can damage the beneficial properties of the oil. Hope that helps. Hi Teresa – Great information!! I’ve been looking for a natural remedy to help with my seasonal allergies – which are in full bloom now on the west coast It sounds like this might work well for me. Is the taste ok to take plain or does the honey need to be used to mask the taste? thanks for your question – it’s an acquired taste that’s for sure! 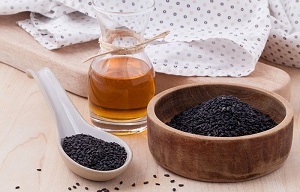 The taste can be quite pungent and strong and one of the most important components that make Black Seed Oil so unique, is the content of volatile oil. Most Black Seed Oil on the market contains somewhere between 0.3%-1.2% volatile oil. The STRONG one that I’m taking contains between 4.3%-4.9% volatile oil, which makes it very pungent. The honey is able to mask the taste a little but after a while, you will get used to the taste. Hi and thanks for letting us know how the black seed oil works for you. I’m interested now, due to also having trouble falling asleep. It always takes me hours and before midnight it is often impossible. I get up at five in the morning every day though and would appreciate a good sleep before midnight. I’ll have to check out the previous post about the black seeds now and find out where I can get this oil here in Thailand. yes please do check out my previous article as it will contain much more info. 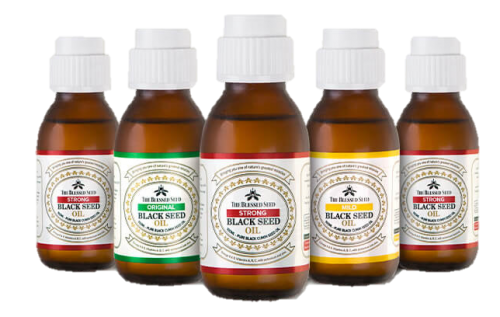 The company I use (called The Blessed Seed) are the only company that supplies the world’s strongest Black Seed Oil – they also offer a 1-year-no questions asked, money-back guarantee. They will pay for return postage – even if the bottle is empty! No other Black Seed company can offer this. I had a reader from New Zealand wanting to know if she could get it shipped over there and the company do ship to most countries including Thailand. The standard economy shipping is free. They have an option for tracking which customers can pay for and they do strongly recommend you opt for this as it is a long distance to cover. The tracking option price will depend on what item you order and how much. For example, a small 100ml bottle will cost $3.59 USD or a large 1 litre bottle will cost $7.19 USD. They ship from Germany and all the prices will be in USD. To get the prices, head over to their site here. Go to the top of the page for the ‘countries’ list, and select Thailand. Then add the items needed in the basket, when you view the basket you will see the tracking option price. I hope that helps and wish you well in using Black Seed Oil. Please visit back and let me know of your experiences. Peace be with you. Castor oil is another age old remedy and the effects are quite similar, although the health benefits and actions of the Black Seed are more so. The main differences are the make up of compounds of each plant which makes them unique so in themselves. I hope you do get to try the oil out and return with your experiences and insights. Thanks for reading. I’m so glad to hear that this has helped you to sleep! My friend was having issues with insomnia lately. I’ll have to refer her to your site. please do! I’m sure your friend can appreciate any help given for her recent insomnia – and hopefully it can help boost her health in the long run. Take care and have a great week ahead. Wow, Teresa! I have never heard of Black Seed Oil before. This post is very informative, especially as it shares your personal anecdotes about how the oil seems to be working for you. I imagine that this information can be quite helpful to many who are looking for a daily supplement to fight that impressive list of conditions you site in the beginning of this post. Thank you for bringing this marvelous medicine to my attention! thanks so much for stopping by and really happy to have enlightened you in the marvels of this wondrous plant. My experiences have definitely been really positive so far and I’m just amazed that a natural product can work so quickly! Hope you give it try too. Have a great week and peace be with you.